The Arena Corinthians is a sports stadium located in São Paulo, Brazil and owned, operated, and used by Sport Club Corinthians Paulista. It has a seating capacity of 49,205, making it the fifth-largest stadium used by teams in the top tier of the Brazilian League and the eleventh-largest in Brazil. It hosted six matches during the 2014 FIFA World Cup, including the opening match on 12 June 2014. Because of a requirement for it to have at least 65,000 seats for the World Cup opening match, temporary seats were added to the stadium for the tournament. The temporary seats started to be removed shortly after its last World Cup match. In 2016, a scandal arose, when Emílio Odebrecht stated that the stadium was only built because former president Lula asked for it and the stadium was built as a "gift" for him, during Lula's and Dilma's governments. Under PT governments from 2003 to 2015, the Odebrecht group's revenues jumped from 17 to 132 billion. In 1980, Corinthians was planning to build a new 201,304-capacity stadium, as their own Alfredo Schürig Stadium, also known as Parque São Jorge, held fewer than 14,000 people and city's Pacaembu Stadium had to be shared with other teams. Plans to build a new stadium required a large area. The club's president Vicente Matheus asked for a concession from São Paulo's mayor Olavo Setúbal in the Itaquera region, east of the city centre. The mayor accepted the request 10 November 1978 and a concession for 90 years was granted on 26 December 1978 for a 197,095.14 square metres (2,121,514.4 sq ft) property. The area was owned at the time by COHAB, an agency for public housing controlled by the São Paulo City government. The original plan was to build the stadium in three to five years. The concession was renewed in 1988 for 90 years, with the condition that any construction made in the area would revert to the city at no cost. However, funding was not obtained and other alternatives were considered, such as a concession for the Pacaembu Stadium and demolishing the Alfredo Schürig Stadium making room for another. On 31 August 2010, Corinthians announced the construction of the stadium with an estimated cost of R$335 million and an expected gross revenue of R$100 million per year. The original plans allow for an expansion to 70,000 seats. The club expected to get financing from BNDES and sell the naming rights for the stadium to pay for the construction costs. The main architect of the project was Aníbal Coutinho; he was assisted by Antônio Paulo Cordeiro from Coutinho, Diegues, Cordeiro (DDG), partnering with Werner Sobek, who rendered structural engineering services. The stadium was planned to be completed by March 2013. Accenture estimated that the World Cup opening would bring R$30.75 Billion over 10 years to the city's economy; the study's results encouraged Brazil to site the opening match in São Paulo. A study from Fundação Getúlio Vargas estimated R$1 Billion in revenue during the World Cup, as 290 thousand tourists were expected for the event. After Morumbi Stadium was deemed unsuitable by FIFA, the Local World Cup Committee looked for alternatives and set on offering Arena Corinthians to host the opening game; FIFA accepted the suggestion and confirmed the decision on 10 October 2011. Hosting the opening game required modifications to the project that raised the cost from the original R$335 million to R$1.07 billion to accommodate FIFA's requirements. Cuts in equipment, furniture and construction costs reduced the cost. Because of FIFA's agreements with Brazil, none of the construction work related to the World Cup was taxed by the Federal Government; the final price agreed upon was R$820 million. A new contract was signed on 19 July 2011 with Odebrecht; R$400 million of the total would be financed by BNDES and the remaining R$420 million would come from tax credits granted by the City. A 2007 law stated the tax credits could be used by any company that established itself in the Eastern region of the city, providing a credit of R$0.60 per R$1.00 invested. A new law was passed by the city legislature to deal specifically with this stadium and reduce the incentives, linking the concession of the credits to hosting the World Cup opening match and limiting the total amount of credits to R$420 million. The concession was justified by the expectation that the stadium will generate R$950 million in city taxes during the six years after its opening. R$530 million in excess of the tax credits were given. The financing contract with BNDES was signed on 29 November 2013, under their ProCopas Arenas World Cup program. Caixa Econômica Federal is the distributing agent. The estimated construction cost did not include the R$38.1 million required for adding temporary bleachers, which were removed after the World Cup was over. They were set on one of the sides and on the north and south ends. The addition of the bleachers would raise the stadium's capacity up to 72,000 seats, but would necessitate the relocation of VIP areas and television equipment reducing capacity. Corinthians paid for additional temporary infrastructure required exclusively for the World Cup, which was estimated to cost between R$60 million and 100 million. The World Cup brought more than 500,000 tourists and an estimated R$1 billion in revenue to the city. The stadium eventually cost R$965 million, 15% more than originally estimated. The two-year delay in receiving BNDES funds caused an increase of R$108 million to the cost because of the difference in interest between loans taken from regular banks and from the government agency. Temporary structures were included in the total cost, currently estimated to be R$77 million. After the sale of the tax credits received, Corinthians will have to pay between R$700 and R$750 million spread over 12 years. Aníbal Coutinho projected the stadium to generate R$150 million per year. Andres Sanchez expects revenue to reach R$200 million per year and expenses to be up to R$35 million per year. Revenue will come from ticket sales and commercial properties in the arena, especially corporate conventions, fairs and events. On 25 August 2013, Andres said that out of 16 naming rights properties, he had already secured seven buyers, although no deals had yet been formalised. The club plans to sell the stadium naming rights for R$400 million for 20 years. The stadium was delivered to Corinthians on 15 April 2014. Modifications for hosting the World Cup were still underway until the club handed the arena to FIFA for the competition on 20 May 2014. The peak number of workers on site was 2,300, recorded in November 2012. The enterprise generated 26 thousand jobs during its construction. After the World Cup, Corinthians is preparing the stadium for their use; they consider it is 92% ready for their use just after the tournament. It is expected to be completely retrofitted by February 2015. The estimated cost is R$20 million. One of the largest changes will be the construction of large balconies and the installation of scoreboards behind the goals where the temporary seating installed for the FIFA World Cup stands. The west side will have a large, tree-lined, pedestrian mall with a reflecting pool and new illumination. The reflecting pools will also work as a performance fountain, providing splash and spectacle at programmed moments during stadium events. Around the complex, granite flooring will have stripes evocative of the club's second uniform, in synchronisation with the external illumination. There will be benches and large gardens; the media centre will be housed in one of them. The landscaping was designed by John Loomis, who headed the Burj Khalifa project. Lighting was projected by the American firm T. Kondos. The first event held in the arena was an Ivete Sangalo show for 3,000, celebrating the club's 103rd anniversary on 29 September 2013. The first public football matches at the stadium consisted of friendlies between former Corinthians' players on 10 May 2014.More than 100 players played at the event. The first goal of the new stadium was scored by Rivellino shooting a penalty kick suffered by Palhinha. Rivellino shot at his own goal because all the players on the pitch insisted that the first goal at the Arena was his. The kick went past Ronaldo. The first competitive game was a 2014 Campeonato Brasileiro Série A match between Corinthians and Figueirense on 18 May 2014. The first international match was the opening match for the FIFA World Cup 2014 between Brazil and Croatia on 12 June 2014. The stadium was one of the venues for the 2014 FIFA World Cup. Because of FIFA rules, it was called Arena de São Paulo during the tournament. The stadium hosted the opening ceremony followed by the opening match between Brazil and Croatia, three other group stage matches, a Round 16 match and a semi-final. Because of the request of at least 65,000 seats for the World Cup opening match, temporary seats were added to the stadium for the tournament, although the final usable capacity only reached 62,200 for the opening match. The addition of temporary seats implied that screens for the World Cup had to be rented specially for the event, because the original screens were too large to be used with the temporary seating installed. FIFA requires screens smaller than the originally projected, with a 90 square metres (970 sq ft) area. Because subsequent matches had lower VIP and press demands, 4,000 more seats were added, raising the usable capacity to 66,200. Arena Corinthians was one of the venues of the 2016 Summer Olympics football tournament. It was chosen instead of competitors Morumbi Stadium—the chosen venue before Arena Corinthians was built— and Allianz Parque. Sixteen games were played in the stadium from 3 to 16 August 2016; they were divided equally between men's and women's tournaments. Two matches were played at 17:00 and 21:30 hours on competition days. Twelve matches were valid for the preliminary stages and four for the quarterfinals. Semifinals and finals were played in the Maracanã Stadium. The stadium was called Estádio do Corinthians by Corinthians when it was announced. The name being used on the club's official website is Arena Corinthians. The Brazilian Football Confederation uses the name Arena Corinthians. FIFA refers to the Stadium as Arena de São Paulo during the World Cup, but recognises the name Arena Corinthians. The largest media company in Brazil, Rede Globo, uses Arena Corinthians like sports diary Lance! Local media have tried to give it nicknames. For example, newspaper Folha refer to Arena Corinthians as Itaquerão; O Estado de S. Paulo uses both the neighbourhood-based nickname and the official name. Rede Record uses Fielzão. The club plans to sell the stadium naming rights for R$400 million for 20 years. A study by Brunoro Sports Business estimated that the value should be R$21 million per year. Companies Petrobras, Ambev, Grupo Petrópolis, Etihad Airways, Qatar Foundation, Caixa Econômica Federal, Emirates Airlines, Bradesco, Telefonica, BMG, Itaú Unibanco, Santander Group, Kalunga and Zurich Insurance Group have all been named as possible buyers, but no deal has been announced yet. Aníbal Coutinho designed the stadium to be one "that would help the supporters, that would help the team to win matches, I wanted to make the supporters get on the pitch". Aníbal led a team of 25 architects. The complex is in a 197,095.14 square metres (2,121,514.4 sq ft) property. The built up area is 189,000 square metres (2,030,000 sq ft) with 17,500 cubic metres (620,000 cu ft) of concrete. 80% of the structural construction is made of precast elements, 40% manufactured on a 7,500 square metres (81,000 sq ft) plant on-site. The rectangular, 267 by 228 metres (876 by 748 ft), 43 metres (141 ft) tall stadium has two buildings; the main building on the west side and another on the east side. When measurements are taken from the pitch, the east side height is 51 metres (167 ft), the west side is 57 metres (187 ft) and the north and south ends are 15 metres (49 ft) tall. The pitch sits at exactly 777 metres (2,549 ft); Aníbal Coutinho said, "The number 77 is considered lucky for the club. The club is located at 777 São Jorge St. and it brings to mind the 1977 that they won one of their most celebrated championships of all time." (the Campeonato Paulista of 1977). The west side has a 6,200 square metres (67,000 sq ft) façade. VIP seats, television crew equipment, press and most box seats are in the west building. The glass has been designed with a curvature intended to simulate the visual effect of a ball hitting the net. Special, seamless, 26 metres (85 ft) beams have been developed to support the structure. The geometry consulting company Evolute GmbH developed panelling that rationalised the 5,400 square metres (58,000 sq ft) double-curved freeform glass surface into 855 planar and cylindrical panels, all in hot bent toughened glass. This solution allowed for minimising the number of shapes necessary by 93%, reducing costs considerably. The photo-voltaic glass powers the air conditioning. The complete glass structure is 6,900 square metres (74,000 sq ft) counting the sides; the façade width is 220 metres (720 ft) by 24 metres (79 ft) tall. The east side of the stadium houses one of the largest video screens of the world, 170 by 20 metres (558 by 66 ft)—3,400 square metres (37,000 sq ft). It has 210,000 individual LEDs; 1,320 custom made luminaires are fitted in 4 metres (13 ft) long glass sheets. The screen is manufactured by Osram Traxon and is controlled by an E:cue lighting control. Glass for both façades were provided by Italian company Sunglass SRL, using Asahi Glass Co.'s Planibel Clear glass. External walls are covered by 12,000 square metres (130,000 sq ft) of white Levantina Techlam ceramic tiles, A 12 metres (39 ft) Corinthians symbol, constructed from stainless steel and backlighting, will be mounted on the south wall of the east side. The public circulates using 10 escalators, 15 lifts, two ramps and 13 staircases. 59 concession stands are available, as is an auditorium for 360 people and a 25,000 square metres (270,000 sq ft) convention center under the west building. A museum dedicated to Corinthians will be set up in the east building. Interior design is designed by Gensler. There are six changing rooms. Home team changing rooms occupy 1,300 square metres (14,000 sq ft), with jacuzzis, cryotherapy and a private area for the coach. The warm-up area has seating for 86 VIP ticket holders, and is separated by soundproof glass. All the public areas have air conditioning and are finished in marble, granite or top tier ceramic tile. There are 49,205 seats. The stadium has 6,000 second tier covered seating and 10,000 VIP seats. 89 luxury boxes accommodate 1,414 spectators. Distributed on the West building's 5th and 6th floors, 87% have 12 seats, 10% between 21 and 33 seats and 4 units more than 70 seats. The largest units will cover more than 470 square metres (5,100 sq ft). The lowest ring of bleachers encircle the entire arena. It holds 10,500 seats on each side, 6,000 behind the south goal and 9,000 behind the north goal for a total of 35,000+ places. The distance between the first row of seating and the field is 9 metres (30 ft) on all sides. General seating is provided by Bluecube³ using an exclusive design based on the Integra model. There are four different finishes, ranging from straight chairs without arms to stuffed chairs in leather. Most seats are white. Business level and box seats are finished in black leather and made by Poltrona Frau. The 600 seats have laser-engraved club crests. The underside of the roof is lined by a membrane. Werner Sobek designed the roof, which is held in place by 48 75 metres (246 ft)-long trusses. The west and east sides are joined by two identical structures that have a free span of 170 metres (560 ft). The total east-west roof length is 245.75 metres (806.3 ft). Aníbal Coutinho intended to bring a paulistano flair to the construction using structures that resemble the São Paulo Museum of Art, a symbol of the city. The height of the roof and weight of the trusses required the use of the largest crawler crane available in Latin America. The steel beams together weigh 4,000 tons. The roof has four layers. On the underside is a layer of corrugated steel sheets. Above them, thermal and acoustic insulation is provided by Polyisocyanurate sheets. A layer of plasterboard is above it. Finally, the entire roof is covered with 40,000 square metres (430,000 sq ft) of Firestone Ultraply TPO. On the underside, a flexible membrane covers the structure. This final layer helps to collect rainwater for reuse in other areas of the stadium. The structure was redesigned to duplicate the current noise level supporters create during games. Measurements taken on Pacaembu show that sound levels reach a peak of 113dB when goals are scored. 4,500 square metres (48,000 sq ft) of glass will be installed on the end closest to the pitch of the west and east roofing. The entire structure measures 32,300 square metres (348,000 sq ft) and weights 6,500 tons. Osram will install four scoreboards in the stadium, on the north and south ends, above the bleachers. They will be set in pairs, with one facing the pitch and one facing outside. Each screen is 225 square metres (2,420 sq ft) and measures 30 by 7.5 metres (98 by 25 ft). The inside-facing screen will have a 7mm dot pitch and the outside-facing screens will have a 20mm dot pitch. 3,500 flat panel televisions are installed throughout the stadium, individually or as video walls, comprising 3,100 stations. The pitch lighting is going to use 352 Osram Siteco 2000-Watt Metal-halide 6000K multivapour lamps, guaranteeing over 90% colour fidelity. The 5,000 lux lighting is completely uniform and is 50% brighter than FIFA's recommendation. Osram provides lighting for the entire complex. The field has recommended FIFA dimensions of 105 by 68 metres (115 by 74 yd). It was prepared by World Sports in partnership with Desso. The field is made up of Perennial Ryegrass, which is grown directly at the site. The original idea was to use black grass to avoid the colours of Palmeiras—Corinthians' biggest rivals—but it was proved to be technically impossible and the club chose to use grass with a darker hue. To improve fixation, the grass is intertwined with 22 million artificial fibres. Ultraviolet lights are used nightly to ensure that all parts of the pitch will receive equal lighting; the field is exposed to only two hours of direct sunlight per day. World Sports uses a blend of three cultivars from DLF-Trifolium, Ph.D. Ryegrass Perenne, from Oregon, US. DLF states that this grass has strong cold and wear tolerance and is disease resistant, combined with fast growth rate. The hue is 8.7 on a scale of 1 to 9, where 9 is dark green. The choice of using ryegrass instead of the most common and usually recommended Bermuda brought advantages like having longitudinal roots, avoiding the cleats to tangle with them, and resistance to yellowing. It also brought challenges; ryegrass is native to cooler climates and needs temperatures of 23 °C (73 °F) for optimum growth. Because the temperature in São Paulo rarely falls below 14 °C (57 °F), a heating system is not used. A cooling systempushes cold water through 40,000 metres (130,000 ft) of drainage pipes, reducing the grass roots temperature to 6 °C (43 °F). The grass is mowed to between 2.2 centimetres (0.87 in) and 2.5 centimetres (0.98 in). The drainage system has two operating modes; gravitational and vacuum-enhanced (Subair System). The vacuum draining system can handle up to 400,000 litres (88,000 imp gal) per hour, improving oxygen levels in the rooting system and cooling the pitch, even during matches. This is equivalent to 56 millimetres (2.2 in) of rain drained in one hour. The irrigation system has individual sprinkler controls, which are controlled by a computerised system. The system comprises 48 sprinklers—twice the minimum FIFA recommendation. The stadium will have wi-fi and 4G LTE in all its sectors. Using smartphones, the public will be able to access game statistics and watch replays that will be published on a website maintained by the stadium crew. A dedicated team will control centrally all the screens and scoreboards. Supporters will be monitored by a computer system connected to hundreds of security cameras. All services are contracted with Sonda IT. There are plans for 75 bars—including 13 in the VIP areas—two restaurants and two sport bars in the stadium. All the restaurants and bars are managed by Diverti Arena on a 10-year contract. Diverti is expected to invest R$40 million in the stadium; all the properties will be fully operational in 2015. Other commercial properties inside the stadium complex are two clothing stores and kiosks whose operators have not yet been decided upon. The project received awards for the Best Commercial Project and the Grand Prize as the Best Overall Project in Brazil in the largest Corporate Architecture events in Latin America in 2011; it competed against 1,116 projects. Reception by Corinthians supporters was enthusiastic according to a poll, with 83% approval of the stadium. Opposition fans have good approval rates of the stadium. Hundreds of supporters frequently visited the construction site. The stadium is 19 kilometres (12 mi) east of the city centre and 21 kilometres (13 mi) away from the São Paulo–Guarulhos International Airport. The nearest subway station is Corinthians-Itaquera, 500 metres (550 yd) from the stadium. It connects to a railway station with the same name. The Artur Alvim subway station is 800 metres (2,600 ft) away. If all the stadium's users boarded trains to leave it, the stadium would be empty in 30 minutes. Created for World Cup matches, an express train connects Luz and the Corinthians-Itaquera CPTM Station, making the trip in 17 minutes. Because of its success, the service was extended to local matches, renamed to 'Expresso Corinthians'. The metro and train stations can accommodate 114,000 passengers per hour. Each metro train can carry 1,600 passengers; trains depart at 85-second intervals. The site has 1,620 covered parking spaces and 929 open air parking spaces, with another 2,214 spaces provided by a shopping mall nearby. There are 61 bus routes that stop close to Arena Corinthians. Corinthians does not plan to host concerts or other sport events in the stadium because the use for non-football events can destroy the pitch and football ticket sales will compensate for the loss of revenue. The club plans to use the structure to host conventions and trade shows, and to promote tours of the stadium. A 2,500 square metres (27,000 sq ft) convention centre will be located under the west building. EA Sports added all 12 venues used at the 2014 FIFA World Cup, including the Arena Corinthians, to the 2014 FIFA World Cup Brazil video game. The Arena Corinthians is featured on You Don't Have to Live Like a Referee, the sixteenth episode of the 25th season of the American animated sitcom The Simpsons, and the 546th episode of the series. Homer Simpson acts as a FIFA World Cup 2014 referee in a game played at Arena Corinthians. The second episode of Discovery Channel's three-episode series Building the World Cup is dedicated to Arena Corinthians. The Netflix show 3% used the stadium's marble big halls and platforms as a shooting location. The circumstances in which Arena Corinthians was chosen as the World Cup stadium for São Paulo, and the resources used for its construction, have been criticised. Jose Serra, governor of São Paulo in 2007, planned to bring the opening game to his state—specifically to the Morumbi Stadium—as soon as Brazil was confirmed as the host nation of FIFA World Cup 2014. Mayor Gilberto Kassab supported the option of Morumbi and was assured that president Luis Inácio da Silva wanted the same. Unhappy with Morumbi, FIFA's secretary general Jérôme Valcke said the Morumbi Stadium could not host the opening game and was the worst among the 12 venues presented to FIFA. He recommended that the city should build a new stadium. FIFA technicians stated that the maximum capacity of the current structure would be 46,000 spectators—below the FIFA minimum of 60,000. São Paulo Futebol Clube's director João Paulo de Jesus Lopes said this was "a lie". FIFA's president Sepp Blatter stated that Morumbi could not host the opening game or semifinals without an extensive renovations plan. The Morumbi Stadium failed to provide proof of funding for a R$630 million renovation plan requested by FIFA to secure its status as a World Cup venue; the stadium was then excluded from the tournament on 16 June 2010. The Local World Cup Committee suggested to use Arena Corinthians instead. FIFA accepted the suggestion and confirmed the decision on 10 October 2011. Journalist Wagner Vilaron from O Estado de S. Paulo deemed the exclusion of the Morumbi Stadium from the World Cup and the subsequent choice of Arena Corinthians as a venue for the event to be politically charged. After receiving several negative responses from FIFA about the renovation project for Morumbi, then-CBF-president Ricardo Teixeira lost patience with São Paulo Futebol Clube officers; he considered that they were delaying the decision by purposely failing to meet the requirements to force the government to spend money on the construction. São Paulo's opposition to Teixeira in the now defunct Clube dos 13 election—which was won by ruling-side Fábio Koff, aligned with São Paulo's Juvenal Juvêncio—irritated the CBF president. At the same time, an affinity between Teixeira and then-president of Corinthians, Andrés Sanchez—who was chosen as the head of delegation for the national team during the 2010 FIFA World Cup and on the same side on Clube dos 13's election—was noticed. São Paulo's mayor Gilberto Kassab supported the selection of the Morumbi Stadium and guaranteed that president Luis Inácio da Silva wanted the same; he blamed FIFA for vetoing the selection. He said Corinthians could not influence FIFA and that CBF wanted Morumbi Stadium to host the opening game. The senior management of São Paulo F.C. criticised the chosen stadium and the selection process on numerous occasions after Morumbi Stadium was excluded from the World Cup. President Juvenal Juvencio said the region had no city structures, hospitals or hotels; the only way to enter or leave the area would be to use a fire engine and that there was no way to create a VIP area around the stadium. Juvenal blamed ex-governor José Serra for Morumbi Stadium's deselection. Serra denied the accusations. Carlos Miguel Aidar, then a candidate for the SPFC presidency, said Arena Corinthians exists because Brazil's president demanded the construction of a new stadium in São Paulo; he also said Corinthians will never repay the loans for the stadium, that Odebrecht was the real owner, that FIFA and the Brazilian government only wanted to make money for construction companies, and that Itaquera was "another world, another country, nobody can get there". Later he visited the Arena by car, recanted his opinion and said the stadium was "marvelous" and could be reached easily. Vinícius Segalla from UOL said tax credits and BNDES resources are public money and that the concession of those resources to Corinthians are unclear. The federal government dismissed the notion, saying that tax credits are intended to encourage economical growth and work opportunities for the areas surrounding the stadia. The city government said tax credits are not subsidies and the stadium will be a boon to the city, especially the east zone. They also said subsidies given to the Brazilian Grand Prix and Carnaval among others also bring benefits to the city. Public Prosecutor Marcelo Milani contested the validity of tax credits issued by the city and sued then-mayor Gilberto Kassab for R$1.74 billion; the judges said Milani's case was without merit and dismissed it. The project executed is not the project approved by the city council in 2011. Amendments were made to the final project, which was submitted on 25 July 2013 and approved on 13 February 2014. Two people were killed in an accident on 27 November 2013, which destroyed part of the east building. A crane fell while carrying a part of the roof, destroying eight columns of the LED screen and part of an internal slab. The structure was not affected because anti-vandalism glass was installed on the east façade. An area of 5,000 square metres (54,000 sq ft) was closed for investigation. Initial hypotheses were human error, crane mechanical failure and unstable ground under the crane. Liebherr said the crane's "black box" data recorder did not record anything on the day of the accident, although it should have done. As of August 2014[update], the case has not yet been concluded. Liebherr paid for a study from the Federal University of Rio de Janeiro, which concluded that the cause was unstable ground— the same conclusion reached by police experts; based on this, police indicted nine construction workers. Odebrecht refuted the conclusions, and showed a study by private company Geocompany as proof. Another report on the incident provided by IPT/University of São Paulo blamed the accident on the counterweights being heavier than what was specified on the rigging plan. Crane operations in the stadium were suspended at the time; all cranes on the site were inspected and approved to continue work 16 days later. The families of the deceased workers received R$2.9 million in compensation. Another worker died in an accident on the site while working on the temporary seating. Local authorities' initial assessment was that the worker caused the accident by not following the required safety procedures. As of March 2014[update], an investigation into the death was underway. ^ a b c d e f g h "O Projeto" [Project] (in Portuguese). 20 June 2013. Archived from the original on 4 June 2013. Retrieved 20 June 2013. ^ a b "Corinthians aumenta capacidade e arena chega perto dos 50 mil lugares" [Corinthians upgrades the capacity and the arena gets close to 50,000 seats] (in Portuguese). Retrieved 2 November 2015. ^ "ALaudo de Prevenção de Incêndio" [Fire Prevention Report] (PDF) (in Portuguese). 9 June 2014. Retrieved 13 November 2014. ^ a b "Match report – Netherlands – Argentina" (pdf). FIFA.com. 9 July 2014. Retrieved 9 July 2014. ^ a b "Terreno do Fielzão ganha traves e novas linhas do 'campo'" [Arena Corinthians get goals and field markings] (in Portuguese). 6 October 2011. Retrieved 20 June 2013. ^ "2014 FIFA World Cup Brazil Kicks Off on Hybrid Grass". 22 November 2013. Retrieved 27 November 2013. ^ a b c d e "Football arena in Sao Paulo: complete stadium lighting from a single source". Retrieved 20 June 2013. ^ Cardilli, Juliana (30 May 2011). "Começam as obras no estádio do Corinthians em SP" [Arena Corinthians construction begins] (in Portuguese). Retrieved 20 June 2013. ^ a b "Obras são entregues ao Clube". 15 April 2014. Archived from the original on 8 May 2014. Retrieved 7 May 2014. ^ a b c d e f "Leia a transcrição da entrevista de Andrés Sanchez ao UOL e à Folha" [Read the transcription of Andrés Sanchez Interview to UOL and Folha] (in Portuguese). 4 June 2014. Retrieved 6 June 2014. ^ "Gramado do estádio do Timão homenageará clube e título de 77" [Arena Corinthians pitch will be an homage to the club and 1977's championship win] (in Portuguese). 17 October 2011. Retrieved 20 June 2013. ^ "Se quiserem mudar o local de abertura da Copa fiquem à vontade, diz Andres à Fifa" [Be free to change opening match venue, Andres tells FIFA] (in Portuguese). 14 May 2013. Retrieved 20 June 2013. ^ a b c "Victory in the race against time". 25 March 2013. Retrieved 20 June 2013. ^ "Laudo de Engenharia" [Engineering Report] (PDF) (in Portuguese). Retrieved 13 November 2014. ^ "Match Schedule". 20 June 2013. Retrieved 20 June 2013. ^ a b "If you build it... Sao Paulo to host opening 2014 World Cup match". Daily Mail. London. 26 February 2011. Retrieved 20 June 2013. ^ a b "Arena Corinthians ganha mais 4 mil cadeiras para Uruguai x Inglaterra" [Arena Corinthians gets extra four thousand seats for Uruguay x England] (in Portuguese). 18 June 2014. Retrieved 18 June 2014. ^ a b "Foram acionados os refletores dos setores leste e oeste, num total de 212 unidades, cada uma com 2.000 watts de potência" [Reflectors were tested on East and West sectors, 212 units with 2000 watts each] (in Portuguese). 24 February 2014. Retrieved 24 February 2014. ^ a b "Após Copa, Arena inicia transição entre "padrão Fifa" e "padrão Timão"" [After the World Cup, Arena starts transition from FIFA to Corinthians operational mode] (in Portuguese). 12 July 2014. Retrieved 12 July 2014. ^ "Corinthians Arena was present for Lula, says patriarch of Odebrecht". Folha de São Paulo. 23 October 2016. Retrieved 3 June 2017. ^ "Odebrecht would have built Itaquerão as a gift to Lula". Veja. 23 October 2016. Retrieved 3 June 2017. ^ "Newspaper: Odebrecht says that Arena Corinthians was 'present' for Lula". Veja. 23 October 2016. Retrieved 3 June 2017. ^ "Mateus agora quer terreno da Cohab" [Now Mateus want Cohab's property] (in Portuguese). 5 September 1980. Retrieved 20 June 2013. ^ a b "Com Geisel, Coríntians mais perto do estádio" [With Geisel, Corinthians is closer to get his stadium] (in Portuguese). 11 November 1978. Retrieved 20 June 2013. ^ a b c "LEI N.o 8851, DE 26 DE DEZEMBRO DE 1978" (PDF) (in Portuguese). 26 December 1978. Retrieved 20 June 2013. ^ "História" (in Portuguese). 20 June 2013. Retrieved 20 June 2013. ^ "LEI Nº 10622, DE 09 DE SETEMBRO DE 1988" [Law 10622, 9 September 1988] (PDF) (in Portuguese). 9 September 1988. Retrieved 20 June 2013. ^ "Vereadores recomendam concessão do Pacaembu; Corinthians já tem projeto" [City councilmen recommend Pacaembu's concession; Corinthians already have a project] (in Portuguese). 9 September 2009. Retrieved 20 June 2013. ^ "FPF banca reconstrução do Parque São Jorge" [FPF will pay for Parque São Jorge renovation] (in Portuguese). Retrieved 20 June 2013. ^ "Empresas marcam reunião para apresentar projeto de estádio ao Conselho corintiano" [Companies schedule a meeting to present stadium projects to Corinthians council] (in Portuguese). 17 May 2010. Retrieved 20 June 2013. ^ "Hicks Muse investe para formar um Corinthians 'caseiro'" [Hicks Muse invests to build a 'homemade' Corinthians] (in Portuguese). 16 February 2000. Retrieved 20 June 2013. ^ a b "Nota Oficial—Estádio do Corinthians: do sonho à realidade" [Official communication - Corinthians' Stadium: from dream to reality] (in Portuguese). 31 August 2010. Archived from the original on 21 September 2013. Retrieved 20 June 2013. ^ "Compacto, estádio corintiano promete ser um caldeirão" [Comapct, Corinthians' stadium promises to be a cauldron] (in Portuguese). 31 August 2010. Retrieved 20 June 2013. ^ "Corinthians busca maior "naming rights" da história" [Corinthians aims to get largest naming rights deal ever signed] (in Portuguese). 5 November 2010. Retrieved 20 June 2013. ^ a b c d e "Corintiano ganha estádio que terá a sua própria cara" [Corinthians fans got a stadium that will have their style] (in Portuguese). 1 December 2012. Retrieved 20 June 2013. ^ a b c "Especial Copa 2014: Arena Corinthians" [World Cup 2014 special: Arena Corinthians] (in Portuguese). 6 March 2013. Archived from the original on 20 March 2013. Retrieved 20 June 2013. ^ "Conselho do Corinthians aprova construção do estádio em Itaquera" [Corinthians council approves the construction of Corinthians stadium in Itaquera] (in Portuguese). 17 September 2010. Retrieved 20 June 2013. ^ a b "Estudo prevê ganho de R$ 31 bi com estádio até 2020" [Study predicts R$ 31 billion revenues with stadium by 2020] (in Portuguese). January 2011. Retrieved 20 June 2013. ^ "Estádio da abertura da Copa 2014 como dinamizador do desenvolvimento da Zona Leste e da Cidade de São Paulo" [World Cup 2014 opening match stadium as a catalyst for East Zone and São Paulo City development] (PDF) (in Portuguese). January 2011. Retrieved 20 June 2013. ^ "São Paulo espera mais de R$ 1 bi com abertura da Copa na cidade" [São Paulo expects to get more than R$ 1 billion with World Cup opening] (in Portuguese). 20 October 2011. Retrieved 20 June 2013. ^ a b "Copa do Mundo começa com jogo da seleção no Itaquerão; Rio abriga a final" [World Cup starts with Brazil on Arena Corinthians; Rio will get the final] (in Portuguese). 20 October 2011. Retrieved 20 June 2013. ^ "Cortes no "Fielzão" barraram hidromassagem e placa de mármore" [Budget cuts on Arena Corinthians denied bathtub and marble finishing] (in Portuguese). 19 August 2011. Retrieved 20 June 2013. ^ "Estádio do Corinthians fica 20% mais barato" [Arena Corinthians got 20% cheaper] (in Portuguese). 8 June 2011. Archived from the original on 24 June 2013. Retrieved 20 June 2013. ^ "Corinthians e Odebrecht fazem acordo sobre valor de estádio: R$ 820 milhões" [Corinthians and Odebrecht agree on stadium price: R$ 820 million] (in Portuguese). 19 July 2011. Retrieved 20 June 2013. ^ "LEI Nº 14.654, DE 20 DE DEZEMBRO DE 2007" [Law 14654, 20 December 2007] (PDF) (in Portuguese). 20 December 2007. Archived from the original (PDF) on 22 September 2013. Retrieved 20 June 2013. ^ "LEI Nº 15.413, DE 20 DE JULHO DE 2011" [Law 15413, 20 July 2011] (PDF) (in Portuguese). 20 July 2011. Retrieved 20 June 2013. ^ "Corinthians assina contrato para financiar a Arena Corinthians" [Corinthians sign financing contract for Arena Corinthians] (in Portuguese). 29 November 2013. Retrieved 29 November 2013. ^ "Convênio define em fevereiro quem vai fazer 20 mil lugares de Itaquera" [Consortium define by February who will provide 20 thousand seats in Itaquera] (in Portuguese). 25 January 2013. Retrieved 20 June 2013. ^ "Corinthians já conversa para manter arquibancada provisória após a Copa". 22 May 2014. Retrieved 22 May 2014. ^ a b "Corintiano ganha estádio que terá a sua própria cara" [Corinthians fans will get a stadium that has their style] (in Portuguese). 1 December 2012. Retrieved 20 June 2013. ^ a b "Itaquerão terá só 61 mil lugares na abertura da Copa" [Arena Corinthians will have just 61 thousand seats for World Cup opening] (in Portuguese). 5 June 2014. Retrieved 5 June 2014. ^ "Balanço: São Paulo estima retorno financeiro de R$ 1 bilhão com a Copa do Mundo" [São Paulo estimates R$ 1 Billion in Revenue from the World Cup] (in Portuguese). 11 July 2014. Retrieved 12 July 2014. ^ "Ainda sem Itaquerão, Corinthians é o 4º clube brasileiro que mais arrecada com estádio" [Still without Arena Corinthians, Corinthians is 4th in stadium revenue ranking] (in Portuguese). 23 June 2013. Retrieved 24 June 2013. ^ a b c d "Itaquerão, o estádio da abertura da Copa" [Arena Corinthians, World Cup 2014 opening stadium] (in Portuguese). 25 August 2013. Retrieved 25 August 2013. ^ "Esclarecimentos sobre matéria publicada na Revista Exame" [Commentary about Exame Magazine article] (in Portuguese). 23 May 2014. Retrieved 23 May 2014. ^ "Arena Corinthians estará 92% pronta na abertura da Copa do Mundo" [Arena Corinthians will be 92% ready on World Cup 2014 opening match] (in Portuguese). 25 January 2013. Retrieved 20 June 2013. ^ "Três empresas disputam Itaquerão" [Three companies fight for Arena Corinthians] (in Portuguese). 12 April 2013. Retrieved 20 June 2013. ^ "Corinthians deve gastar R$ 20 mi para readaptar Itaquerão pós-Copa" [Corinthians will spend R$ 20 million to renovate Arena Corinthians after the World Cup] (in Portuguese). 26 September 2013. Retrieved 26 September 2013. ^ "Intervenção da Fifa faz clube colocar 70 'espi��es' na Arena Corinthians" [FIFA intervention makes club put 70 'spies'on Arena Corinthians] (in Portuguese). 26 September 2013. Retrieved 26 September 2013. ^ a b c "Arena Corinthians terá espelho d'água e fontes" [Arena Corinthians will have a reflecting pool and fountains] (in Portuguese). 31 May 2014. Retrieved 31 May 2014. ^ "Estádio Itaquera SCCP / Itaquera Corinthian Stadium, World Cup 2014" (PDF). Retrieved 10 December 2013. ^ "Com show de Ivete Sangalo na Arena, Timão comemora 103 anos" [With Ivete Sangalo, Corinthians celebrate 103 years] (in Portuguese). 29 September 2013. Retrieved 4 April 2014. ^ "Rivelino scores own goal to open new Corinthians stadium ahead of World Cup". 10 May 2014. Retrieved 18 May 2014. ^ a b "Com ídolos e vaias a Gobbi, torcida faz primeira visita à Arena Corinthians" [With idols and booing to Gobbi, supporters visit Arena Corinthians for the first time] (in Portuguese). 10 May 2014. Retrieved 10 May 2014. ^ a b "Jogo:43" [Match:43] (PDF) (in Portuguese). 18 May 2014. Retrieved 18 May 2014. ^ a b "Match report – Brazil–Croatia" (pdf). FIFA.com. 12 June 2014. Retrieved 12 June 2014. ^ "Clube alugará telões para a Arena Corinthians na Copa, revela Andrés" [Clube will rent scoreboard during World Cup, reveals Andrés] (in Portuguese). 19 March 2014. Retrieved 25 March 2014. ^ "Bola da Vez com Andres Sanchez" ['Bola da Vez' interview with Andres Sanchez] (in Portuguese). 5 April 2014. Retrieved 2 June 2014. ^ "Aperto financeiro atrasa aquisição de telões de estádio corintiano" [Financial constraints delay scoreboards acquisition for the stadium] (in Portuguese). 15 March 2014. Retrieved 25 March 2014. ^ "Itaquerão será entregue inacabado à Fifa" [Arena Corinthians will be delivered unfinished to FIFA] (in Portuguese). 18 March 2014. Retrieved 25 March 2014. ^ "Match report – Uruguay – England" (pdf). FIFA.com. 19 June 2014. Retrieved 19 June 2014. ^ "Match report – Netherlands – Chile" (pdf). FIFA.com. 23 June 2014. Retrieved 23 June 2014. ^ "Match report – Korea Republic – Belgium" (pdf). FIFA.com. 26 June 2014. Retrieved 26 June 2014. ^ "Match report – Argentina – Switzerland" (pdf). FIFA.com. 1 July 2014. Retrieved 1 July 2014. 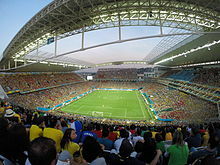 ^ "Rio 2016 Confirms Olympic Football Venues; Valcke Heads to Brazil". 21 March 2014. Retrieved 31 March 2014. ^ "Com Olimpíadas de 2016 no Rio, São Paulo celebra uso do Morumbi nos Jogos" [São Paulo celebrates Morumbi Stadium choice for Rio 2016 Summer Olympics] (in Portuguese). 2 October 2009. Retrieved 31 March 2014. ^ "De olho em eventos da Copa, Palestra é citado como opção para Olimpíadas" [Keen on World Cup 2014 events, Palestra is cited as an option for Olympics] (in Portuguese). 21 September 2011. Retrieved 31 March 2014. ^ "Sumário Executivo" [Executive Summary] (PDF). p. 153. Archived from the original (PDF) on 19 December 2010. Retrieved 31 March 2014. ^ "Rio 2016 - Daily Competition Schedule 1.2" (PDF). Retrieved 31 March 2014. ^ "Arena Corinthians" (in Portuguese). 20 June 2013. Archived from the original on 2 June 2013. Retrieved 20 June 2013. ^ "Remembering the original Corinthians". 3 May 2014. Retrieved 20 May 2014. ^ "Arena Corinthians passa pelo teste de estrutura para a Copa do Mundo" [Arena Corinthians is approved on structural test for the 2014 World Cup] (in Portuguese). 3 May 2013. Retrieved 20 June 2013. ^ "Arena Corinthians" (in Portuguese). Retrieved 20 June 2013. ^ "BNDES fecha empréstimo ao Itaquerão" [BNDES approves loan to Arena Corinthians] (in Portuguese). 18 June 2013. Retrieved 20 June 2013. ^ "Itaquerão" [Arena Corinthians] (in Portuguese). 20 June 2013. Retrieved 20 June 2013. ^ a b c d "Corinthians só poder�� usar Fielzão em 2015, diz arquiteto do estádio" [Corinthians will not be able to use Arena Corinthians before 2015, according to stadium's architect] (in Portuguese). 7 July 2011. Retrieved 20 June 2013. ^ "Batismo de estádio gera receita menor, mesmo com Copa" [Stadium's baptism bring smaller revenue, even with World Cup] (in Portuguese). 18 July 2011. Retrieved 23 September 2013. ^ "Petrobras pode pagar R$ 400 milhões para viabilizar estádio do Corinthians" [Petrobrás may pay up to R$ 400 million to render Arena Corinthians viable] (in Portuguese). February 2013. Retrieved 20 June 2013. ^ "Em Negociação" [Under negotiation] (in Portuguese). 5 May 2012. Retrieved 20 June 2013. ^ "Andrés diz que Itaipava negocia os naming rights com o Timão" [Andrés say that Itaipava negotiates naming rights with Corinthians] (in Portuguese). 11 April 2013. Archived from the original on 16 April 2013. Retrieved 20 June 2013. ^ a b "'Fielzão' pode ganhar patrocínio do Oriente Médio" [Arena Corinthians may be sponsored by Middle Eastern company] (in Portuguese). 12 November 2011. Retrieved 20 June 2013. ^ "Caixa e Corinthians Definem Garantias" [Caixa and Corinthians define collaterals] (in Portuguese). 30 April 2013. Retrieved 20 June 2013. ^ "NAS ASAS DO TIMÃO" [On Corinthians wings] (in Portuguese). 24 November 2011. Retrieved 20 June 2013. ^ a b "Nome depende da Globo" [Name will be dependent on Globo] (in Portuguese). 21 October 2011. Retrieved 20 June 2013. ^ "Telefónica tem proposta para estádio do Corinthians" [Telefonica has an offer for Corinthians Stadium] (in Portuguese). 8 February 2012. Retrieved 20 June 2013. ^ "Montillo pode ser parte de ampla parceria Timão e BMG" [Montillo may be part of an expansive partnership between Corinthians and BMG] (in Portuguese). 16 December 2011. Archived from the original on 14 July 2014. Retrieved 20 June 2013. ^ "310 milhões de reais" [R$ 310 million] (in Portuguese). 4 July 2013. Retrieved 14 August 2013. ^ "Kalunga tenta comprar naming rights da Arena Corinthians" [Kalunga tries to buy Arena Corinthians naming rights] (in Portuguese). 2 February 2014. Retrieved 2 February 2014. ^ "Arena Corinthians" (in Portuguese). 12 June 2013. Archived from the original on 14 July 2014. Retrieved 20 June 2013. ^ "Precast Concrete in Brazilian Arenas for the 2015 World Cup. General Concepts and example: Corinthians Itaquera. SP" (PDF) (in Portuguese). Retrieved 20 June 2013. ^ a b "Arena Corinthians se prepara para sediar abertura da Copa do Mundo 2014" [Arena Corinthians getting ready to host World Cup 2014 opening] (in Portuguese). Retrieved 20 June 2013. ^ a b c "OSRAM e Galtier revelam detalhes das fachadas da Arena Corinthians" [OSRAM and Galtier disclose details of Arena Corinthians façades] (in Portuguese). 14 June 2013. Retrieved 20 June 2013. ^ "Works in Progress". Retrieved 28 June 2013. ^ "Large scale double curved glass façades made feasible—The Arena Corinthians West Façade, Sao Paulo". Retrieved 10 July 2013. ^ "A Casa dos Loucos" [The Madhouse]. 16 May 2014. Retrieved 16 May 2014. ^ "Concluída a montagem dos vidros da fachada principal da Arena Corinthians" [Main façade glass setting is concluded]. Retrieved 8 January 2014. ^ "Corinthians testa o 'maior telão do mundo' em seu estádio em Itaquera". O Estado de S. Paulo. 19 April 2013. Retrieved 18 June 2013. ^ "AGC Supplies All Glass for Arena Corinthians". 23 April 2014. Retrieved 23 April 2014. ^ "Porcelánico español en el flamante estadio Arena Corinthians" [Spanish ceramic on the flaming Arena Corinthians stadium] (in Spanish). 17 June 2014. Retrieved 17 June 2014. ^ "Cerâmica" [Ceramic Tiles] (in Portuguese). 9 August 2012. Retrieved 20 June 2013. ^ "Sobre a Obra" [About the Construction] (in Portuguese). 16 July 2013. Archived from the original on 18 July 2013. Retrieved 16 July 2013. ^ "Mutante" [Mutant] (in Portuguese). 10 October 2011. Archived from the original on 12 December 2013. Retrieved 20 June 2013. ^ "Gensler". Archived from the original on 1 August 2013. Retrieved 20 June 2013. ^ a b "Esbanjando luxo, Arena Corinthians chega à reta final das construções; veja em FOTOS e VÍDEO" [Splashing on luxury, Arena Corinthians is close to the finish line; see pictures and video]. 28 August 2013. Retrieved 28 August 2013. ^ "Arena Corinthians chega a 75,7% de avanço, após quase dois anos de obras" [Arena Corinthians gets to 75,7% completion, after almost two years in construction] (in Portuguese). 2 May 2013. Retrieved 20 June 2013. ^ "Lado oeste da Arena é visto como mina de ouro pelo Corinthians" [West building is seen as a goldmine by Corinthians] (in Portuguese). 18 August 2013. Retrieved 18 August 2013. ^ a b "Com 'cara paulistana', Itaquerão é 'verde' e retangular" [With a São Paulo City stile, Arena Corinthians is 'green' and have a rectangular shape] (in Portuguese). 4 September 2011. Retrieved 22 July 2013. ^ "Inspiração no Dallas e cadeiras brancas" [Dallas Cowboys inspiration and white seats] (in Portuguese). 6 February 2013. Retrieved 20 June 2013. ^ "The first 500 Integra chairs has been installed at Corinthians Stadium in Brazil". 2 September 2013. Retrieved 2 September 2013. ^ "Itaquerão, do Corinthians, terá cadeiras resistentes para combater vandalismo" [Arena Corinthians will have anti-vandal seating] (in Portuguese). 2 September 2013. Retrieved 2 September 2013. ^ "Itaquerão terá poltronas de Ferrari em setor 'very VIP'" [Arena Corinthians will have Ferrari seating on VVIP sectors] (in Portuguese). 14 November 2013. Retrieved 14 November 2013. ^ "Exclusivo: veja em 3D como será a cobertura da Arena Corinthians" (in Portuguese). 3 October 2012. Retrieved 20 June 2013. ^ "Arena Corinthians instala último módulo metálico da cobertura Oeste" [Arena Corinthians install last truss on the west side] (in Portuguese). 29 May 2013. Retrieved 20 June 2013. ^ a b "Cobertura vai dar charme final à Arena Corinthians" [Roof will be Arena Corinthians final glamour touch] (in Portuguese). 16 June 2013. Retrieved 10 September 2013. ^ "New Stadium on Track for 2014 World Cup Games". 20 November 2012. Retrieved 28 June 2013. ^ "VALLOUREC : VALLOUREC CONTRIBUE À LA RÉNOVATION DES PRINCIPAUX STADES DE FOOTBALL POUR LA COUPE DU MONDE DE LA FIFA, BRÉSIL 2014(TM)" (in French). 10 June 2013. Retrieved 28 June 2013. ^ a b "Protótipo da cobertura da Arena Corinthians está 'escondido' no CT" [Prototype of Arena Corinthians roof is 'hidden' on training grounds] (in Portuguese). 22 September 2012. Retrieved 3 July 2013. ^ "ARENA CORINTHIANS - ITAQUERA - SÃO PAULO" (in Portuguese). January 2012. Retrieved 11 July 2013. ^ "Na cara do gol" [In front of goals] (in Portuguese). 29 May 2013. Retrieved 11 July 2013. ^ "Arena Corinthians se prepara para sediar abertura da Copa do Mundo 2014" [Arena Corinthians gets ready to open World Cup 2014] (in Portuguese). Retrieved 1 August 2013. ^ "Acústica do Itaquerão duplicará som da torcida em relação a Pacaembu" [Arena Corinthians acoustics will duplicate supporters sound compared to Pacaembu] (in Portuguese). 4 September 2013. Retrieved 4 September 2013. ^ a b "Arena Corinthians terá iluminação 50% superior à exigida pela Fifa" [Arena Corinthians will have lighting 50% above FIFA standards] (in Portuguese). 2 August 2012. Retrieved 20 June 2013. ^ "Sueño hecho de hormigón, acero y polémica" [Dream made of concrete, steel and controversy] (in Spanish). 19 January 2012. Retrieved 28 June 2013. ^ a b "Veja novo vídeo do projeto em torno do Itaquerão" [Watch new video of Arena Corinthians project surroundings] (in Portuguese). 1 November 2011. Retrieved 20 June 2013. ^ "Arena Corinthians será inaugurada em dezembro sem telões de alta definição" [Arena Corinthians will be inaugurated in December without hi-def scoreboards] (in Portuguese). 19 March 2014. Retrieved 25 March 2014. ^ "Corinthians tem proposta 'espetacular' para 3.500 telas de TV no Itaquerão" [Corinthians has a 'spectacular' offer for 3,500 TV screens on Arena Corinthians] (in Portuguese). 12 February 2013. Retrieved 20 June 2013. ^ "Corinthians apresenta iluminação moderna para seu estádio" [Corinthians presents modern lighting for his stadium] (in Portuguese). 3 August 2012. Retrieved 20 June 2013. ^ "Football Stadiums: Technical recommendations and requirements—5th Edition" (PDF). 2011. p. 66. Retrieved 23 June 2013. ^ "Empresa firma parceria e será responsável pelo gramado da Arena Corinthians" [Company signs contract and will be responsible for Arena Corinthians pitch] (in Portuguese). 5 February 2013. Retrieved 20 June 2013. ^ "Corinthians customiza Itaquerão e integra história, rivalidade e superstição" [Corinthians customizes Arena Corinthians and integrates history, rivalry and superstition] (in Portuguese). 11 November 2012. Retrieved 20 June 2013. ^ Braga, Marcelo (13 June 2013). "Gramado da Arena Corinthians terá tecnologia como de campo de golfe" [Arena Corinthians will have golf courses technology] (in Portuguese). Archived from the original on 16 June 2013. Retrieved 20 June 2013. ^ "Entre as novidades da Arena, Itaquerão terá até discoteca para torcedores" [Among innovations, Arena Corinthians will have even a disco for supporters] (in Portuguese). 23 December 2012. Retrieved 20 June 2013. ^ a b "Campo do Itaquerão terá instalação de grama sintética e resfriamento" [Arena Corinthians pitch will have synthetic grass and cooling] (in Portuguese). 1 November 2013. Retrieved 1 November 2013. ^ "Sementes de grama" [Grass Seeds] (in Portuguese). Retrieved 20 June 2013. ^ a b "Corinthians investe em gramado do Itaquerão por campo perfeito na Copa" [Corinthians inves on Arena Corinthians pitch for perfect surface on World Cup] (in Portuguese). 14 July 2013. Retrieved 15 July 2013. ^ "Perennyal Ryegrass Blend Tech Sheet" (PDF) (in Portuguese). 30 January 2013. Archived from the original (PDF) on 19 May 2014. Retrieved 20 June 2013. ^ a b c "Itaquerão vai inovar conceito de gramado para a Copa" [Arena Corinthians will innovate on pitch concepts for World Cup] (in Portuguese). 16 February 2013. Retrieved 20 June 2013. ^ "Máquinas de sistema inédito de resfriamento do gramado chegam à Arena Corinthians" [Machines with never seen before cooling system arrive t Arena Corinthians] (in Portuguese). 31 October 2013. Retrieved 31 October 2013. ^ "World Sports apresenta novidade no sistema de drenagem a vácuo" [World Sports shows innovative vacuum draining system] (in Portuguese). 9 May 2012. Retrieved 20 June 2013. ^ "Chapter 4—rainfall and evapotranspiration". Retrieved 20 June 2013. ^ "World Sports segue inovando na Arena do Corinthians" [World Sports does not stop to innovate on Arena Corinthians] (in Portuguese). 10 June 2013. Retrieved 20 June 2013. ^ "2014 WORLD CUP BRAZIL: COMBA TELECOM TO SUPPLY A FURTHER FOUR STADIUMS WITH 2G/3G/4G LTE TURNKEY WIRELESS SOLUTIONS". 19 November 2013. Retrieved 21 November 2013. ^ a b "O Itaquerão é Nuestro, Diz a Chilena Sonda" [Arena Corinthians is ours, say Chilean Sonda] (in Portuguese). 2 May 2012. Archived from the original on 17 December 2013. Retrieved 15 August 2013. ^ a b "Corinthians fecha contrato de R$ 40 mi para estádio com empresa alimentícia" [Corinthians signs catering contract that can reach R$ 40 million] (in Portuguese). 21 May 2014. Retrieved 21 May 2014. ^ "Itaquerão ganha prêmio de arquitetura" [Arena Corinthians wins architecture prize] (in Portuguese). 6 June 2011. Retrieved 20 June 2013. ^ "Paulistano apoia Itaquerão mas não se importa com abertura, diz Datafolha" [São Paulo people are in favor of Arena Corinthians but do not care about World Cup Opening, says Datafolha] (in Portuguese). 19 August 2011. Retrieved 20 June 2013. ^ "Obras das novas arenas de Corinthians e Palmeiras são acompanhadas diariamente por torcedores" [Corinthians and Palmeiras construction are visited daily by supporters] (in Portuguese). 25 April 2013. Retrieved 20 June 2013. ^ "Corintianos visitam Itaquerão e reclamam de punição por morte de torcedor boliviano" [Corinthians fans visited Arena Corinthians complain about Bolivian supporter death related penalties] (in Portuguese). 23 February 2013. Retrieved 20 June 2013. ^ "Metrô e trem vão dar conta de esvaziar Itaquerão em meia hora, diz Alckmin" [Subway and train will be enough to evacuate Arena Corinthians, says Alckmin] (in Portuguese). 21 October 2011. Retrieved 20 June 2013. ^ "'Expresso da Copa' leva 17 minutos do centro ao Itaquerão" ['World Cup Express' takes 17 minutes from downtown to Arena Corinthians] (in Portuguese). 28 November 2012. Retrieved 20 June 2013. ^ "Transporte público vai manter Expresso até Itaquera" [Public Transport Administration decides to keep Itaquera express train service] (in Portuguese). 11 July 2014. Retrieved 12 July 2014. ^ "Brazil 2014 delegation visits Arena de Sao Paulo". 19 August 2013. Retrieved 23 June 2014. ^ "Sao Paulo working on fan mobility solutions". 13 December 2011. Retrieved 20 June 2013. ^ "Estacionamentos" [Parking lots] (PDF) (in Portuguese). Retrieved 20 June 2013. ^ "Linhas de ônibus que passam perto da estação Corinthians - Itaquera" [Bus service that serves Corinthians-Itaquera station] (in Portuguese). 20 June 2013. Retrieved 20 June 2013. ^ "Recordes de renda fazem Corinthians rechaçar shows em Itaquera" [Record ticket revenue drives Corinthians to refuse shows on Itaquera] (in Portuguese). 18 November 2011. Retrieved 20 June 2013. ^ "Corinthians fecha nova arena para shows e restringe ingressos a sócio-torcedores" [Corinthians denies shows on the new stadium and saves tickets for season ticket holders] (in Portuguese). Retrieved 20 June 2013. ^ "Building the World Cup". Retrieved 16 May 2014. ^ "Episodios" [Episodes] (in Spanish). Retrieved 16 May 2014. ^ "Começa "guerra civil" pela Copa-2014" (in Portuguese). 29 October 2007. Retrieved 31 March 2014. ^ a b "Exclusivo. "O apoio do Lula era tudo o que eu precisava para brigar pelo Morumbi", Kassab" [Exclusive. "Lula's support was all I needed to fight for Morumbi", says Kassab] (in Portuguese). 8 July 2010. Retrieved 31 March 2014. ^ "Projeto do Morumbi tem erros e pode ficar sem abertura da Copa de 2014, diz jornal" [Morumbi's project has mistakes and may not be the choice to host World Cup's opening, says newspaper] (in Portuguese). 2 June 2009. Retrieved 31 March 2014. ^ "Blatter diz que Morumbi não pode receber jogos importantes em 2014" [Blatter says that Morumbi will not be able to host important matches in 2014] (in Portuguese). 29 September 2009. Retrieved 31 March 2014. ^ "CBF afirma que Morumbi está fora da Copa de 2014" [CBF states that Morumbi is out of World Cup 2014] (in Portuguese). 16 June 2010. Retrieved 20 June 2013. ^ a b "Poder político ajuda Itaquerão contra o Morumbi na Copa de 2014" [Political power helps Arena Corinthians against Morumbi on World Cup 2014] (in Portuguese). Retrieved 1 December 2013. ^ "Juvenal Juvêncio detona Itaquera e Fielzão" [Juvenal Juvêncio bashes Itaquera and Arena Corinthians]. 10 October 2010. Retrieved 2 April 2014. ^ "Juvenal: 'Palmeirense Serra tirou Morumbi da Copa'" [Juvenal: 'Palmeiras supporter Serra is the one who excluded Morumbi from the World Cup]. 8 April 2014. Retrieved 8 April 2014. ^ "José Serra rebate Juvenal Juvêncio sobre Morumbi: 'Ele não fala coisa com coisa'" [José Serra contests Juvenal Juvêncio about Morumbi: 'He does not make any sense']. 9 April 2014. Retrieved 9 April 2014. ^ "Candidato de Juvenal alfineta rival: 'o Corinthians não é dono do estádio, nunca vai pagar'" [Juvenal's candidate teases rival: 'Corinthians does not own the stadium, never will pay']. 26 March 2014. Retrieved 2 April 2014. ^ "Aidar revela visita à Arena Corinthians e, agora, diz ser possível ir a Itaquera" [Aidar visited Arena Corinthians and now says that it is possible to go to Itaquera]. 26 May 2014. Retrieved 3 June 2014. ^ "Itaquerão é obra privada da Copa com maior volume de recursos públicos" [Arena Corinthians is the private construction with larger share of State resources] (in Portuguese). 23 June 2013. Retrieved 9 September 2013. ^ "Governo brasileiro desmente uso de dinheiro público em estádios da Copa" [Brazilian government denies public money on World Cup stadiums] (in Portuguese). 23 June 2013. Retrieved 31 March 2014. ^ "Esclarecimentos sobre os incentivos da Prefeitura para a construção do Estádio do Corinthians, em Itaquera" [Clarification about City of Sao Paulo incentives for the construction of Arena Corinthians] (in Portuguese). 22 June 2011. Retrieved 31 May 2014. ^ "Ação Arquivada" [Motion Dismissed] (in Portuguese). Retrieved 1 December 2013. ^ "Projeto do Itaquerão está em situação irregular" (in Portuguese). Retrieved 1 December 2013. ^ "Extrato 50ª Reunião Ordinária" [Minutes from the 50th Ordinary Meeting] (in Portuguese). Retrieved 2 February 2014. ^ "Acidente nas obras do estádio do Corinthians deixa feridos e um morto" [Accident on Arena Corinthians construction leave wounded and one dead] (in Portuguese). 27 November 2013. Retrieved 27 November 2013. ^ "Corinthians evita falar em atraso na entrega do estádio para a Copa" [Corinthians avoids to make statements about delays to the Cup] (in Portuguese). 27 November 2013. Retrieved 27 November 2013. ^ "Sao Paulo stadium accident leaves two dead". BBC News. 27 November 2013. Retrieved 28 November 2013. ^ "Vidro 'antivândalos' ameniza acidente e 'salva' Copa do Mundo no Itaquerão" ['Antivandal' glass diminished damage and 'saved' World Cup on Arena Corinthians] (in Portuguese). 27 November 2013. Retrieved 27 November 2013. ^ "Arquiteto registra em vídeo momento do acidente na Arena Corinthians" [Architect recorded Arena Corinthians accident on video] (in Portuguese). 28 November 2013. Retrieved 28 November 2013. ^ "Arena Corinthians: caixa preta do guindaste não registra acidente" [Arena Corinthians: black box does not register accident] (in Portuguese). 28 January 2014. Retrieved 31 March 2014. ^ "Peritos alemães analisam caixa preta do acidente na Arena Corinthians" [German experts analyze black box of Arena Corinthians accident] (in Portuguese). Retrieved 1 December 2013. ^ a b "Construtora de estádio corintiano nega afundamento de solo em acidente" [Stadium builders deny terrain erosion on accident] (in Portuguese). 4 April 2014. Retrieved 4 April 2014. ^ "Polícia indicia 9 pessoas por queda de guindaste na Arena Corinthians" [Police indicts nine for crane accident at Arena Corinthians] (in Portuguese). 15 July 2014. Retrieved 15 July 2014. ^ "Laudo diz que falha no plano de operação do guindaste causou acidente no Itaquerão" [Technical report states that bad execution on operational plan caused the accident on Arena Corinthians] (in Portuguese). 4 August 2014. Retrieved 4 August 2014. ^ "Ministério do Trabalho embarga atividade com guindastes na Arena" [Work Ministry suspend crane operations on Arena Corinthians] (in Portuguese). Retrieved 1 December 2013. ^ "Todos os guindastes voltam a operar na obra da Arena Corinthians, em São Paulo" (in Portuguese). Retrieved 1 December 2013. ^ "Odebrecht paga R$ 2,9mi às famílias dos mortos em Itaquera" [Odebrecht pay R$ 2.9 million compensation to families of workers dead on accident] (in Portuguese). 6 April 2014. Retrieved 6 April 2014. ^ "Worker dies in Sao Paulo World Cup stadium accident". Reuters. 29 March 2014. Retrieved 31 March 2014. ^ "Delegado diz que negligência com segurança causou acidente no Itaquerão" [Police officer says that not adhering to safety procedures caused accident on Arena Corinthians] (in Portuguese). 30 March 2014. Retrieved 31 March 2014.